Heterogeneous catalysis is a type of catalysis in which the catalyst occupies a different phase than the reaction mixture. Catalysts can be divided into homogeneous and heterogeneous catalysts, depending on whether they occupy the same phase as the reaction mixture. In general, heterogeneous catalysts are solids that are added into gas or liquid reaction mixtures. In heterogeneous catalysis, the reactants adsorb onto binding sites on the surface of the catalyst, and the availability of these reaction sites can limit the rate of heterogeneous reactions. catalyst: A substance that increases the rate of a chemical reaction without being consumed in the process. Catalysts are chemical compounds that increase the rate of a reaction by lowering the activation energy required to reach the transition state. Unlike reactants, a catalyst is not consumed as part of the reaction process. The process of speeding up a reaction by using a catalyst is known as catalysis. Adsorption of ethene on a solid catalyst surface: The catalyst aligns the ethene molecule with hydrogen, allowing the two to react more efficiently than if they were simply combined in a container, and were colliding at random. Catalysts can be divided into two types, homogeneous or heterogeneous, depending on the reaction phase that they occupy. Homogeneous catalysts are those that occupy the same phase as the reaction mixture (typically liquid or gas), while heterogeneous catalysts occupy a different phase. Generally, heterogeneous catalysts are solid compounds that are added to liquid or gas reaction mixtures. The reason such catalysts are able to speed up a reaction has to do with collision theory. Recall that according to collision theory, reactant molecules must collide with proper orientation. A catalyst essentially acts like a “traffic cop,” aligning molecules in just the right way so that it’s easier for them to combine and react. Heterogeneous catalysis has a number of benefits. For one, heterogeneous catalysts can be separated from a reaction mixture in a straightforward manner, such as by filtration. In this way, expensive catalysts can be easily and effectively recovered, which is an important consideration for industrial manufacturing processes. However, one limitation of heterogeneous catalysis has to do with the available surface area of the catalyst. Once the surface of the catalyst is completely saturated with reactant molecules, the reaction cannot proceed until products leave the surface, and some space opens up again for a new reactant molecule to adsorb, or attach. It is for this reason that the adsorption step in a heterogeneously catalyzed reaction is oftentimes the rate-limiting step. Despite this, the overall benefits of heterogeneous catalysis often outweigh its disadvantages, in that the catalyzed reaction is still much faster than the uncatalyzed reaction. Homogeneous catalysis is a class of catalysis in which the catalyst occupies the same phase as the reactants. Catalysts can be divided into two types: homogeneous and heterogeneous. Homogeneous catalysts occupy the same phase as the reaction mixture, while heterogeneous catalysts occupy a different phase. Homogeneous catalysts allow for greater interaction with the reaction mixture than heterogeneous catalysts. homogeneous mixture: A substance that is uniform in composition. Catalysts are compounds that, when added to chemical reactions, reduce the activation energy and increase the reaction rate. The amount of a catalyst does not change during a reaction, as it is not consumed as part of the reaction process. Catalysts lower the energy required to reach the transition state of the reaction, allowing more molecular interactions to achieve that state. However, catalysts do not affect the degree to which a reaction progresses. In other words, though catalysts affect reaction kinetics, the equilibrium state remains unaffected. Catalysts can be classified into two types: homogeneous and heterogeneous. Homogeneous catalysts are those which exist in the same phase (gas or liquid ) as the reactants, while heterogeneous catalysts are not in the same phase as the reactants. Typically, heterogeneous catalysis involves the use of solid catalysts placed in a liquid reaction mixture. Catalysis: Note the lowered activation energy of the catalyzed pathway. Acid catalysis, organometallic catalysis, and enzymatic catalysis are examples of homogeneous catalysis. Most often, homogeneous catalysis involves the introduction of an aqueous phase catalyst into an aqueous solution of reactants. In such cases, acids and bases are often very effective catalysts, as they can speed up reactions by affecting bond polarization. An advantage of homogeneous catalysis is that the catalyst mixes into the reaction mixture, allowing a very high degree of interaction between catalyst and reactant molecules. However, unlike with heterogeneous catalysis, the homogeneous catalyst is often irrecoverable after the reaction has run to completion. Homogeneous catalysts are used in variety of industrial applications, as they allow for an increase in reaction rate without an increase in temperature. Interactive: Catalysis: The model contains reactants which will form the reaction: A₂ + B₂ –> 2 AB. In this case the model has been set so the activation energy is high. Try running the reaction with and without a catalyst to see the effect catalysts have on chemical reactions. 1. Run the model to observe what happens without a catalyst. 2. Pause the model. 3. Add a few (3 – 4) catalyst atoms to the container by clicking the button. 4. Run the model again, and observe how the catalyst affects the reaction. Enzymes are proteins that accelerate biochemical transformations by lowering the activation energy of reactions. Enzymes are a special class of catalyst that can accelerate biochemical reactions. Enzymes are proteins that bind reactants, or substrates, in regions called active sites. Upon binding, conformational changes in enzymes result in stabilization of the transition state complex, lowering the activation energy of a reaction. substrate: The reactant(s) involved in a biochemical reaction catalyzed by an enzyme. enzyme: A globular protein that catalyzes a biological chemical reaction. active site: The area within an enzyme where the substrate binds. Synthetic catalysts are used to accelerate a variety of industrial processes and are crucial to the chemical manufacturing industry. However, catalysts are also found in nature in the form of enzymes. Enzymes are proteins that are able to lower the activation energy for various biochemical reactions. They do this by binding the reactant(s), known as the substrate(s), to an active site within the enzyme. At the active site, the substrate(s) can form an activated complex at lower energy. Once the reaction completes, the product(s) leaves the active site, so the enzyme is free to catalyze more reactions. Enzyme catalysis: An enzyme catalyzes a biochemical reaction by binding a substrate at the active site. After the reaction has proceeded, the products are released and the enzyme can catalyze further reactions. One model of enzyme mechanism is called the induced fit model. This model proposes that the binding of the reactant, or substrate, to the enzyme active site results in a conformational change to the enzyme. 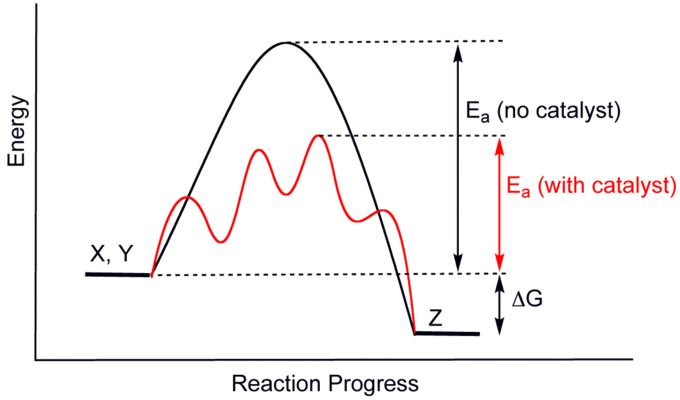 This change stabilizes the transition state complex, and thus lowers the activation energy. Bond strain: enzymes can destabilize bonds within the substrate. Proximity and orientation: conformational changes in the enzyme upon substrate binding can bring reactive groups closer together or orient them so they can react. Proton donors and acceptors: the presence of acidic or basic groups can affect bond polarization and reaction speed. Electrostatic catalysis: electrostatic attractions between the enzyme and the substrate can stabilize the activated complex. Covalent catalysis: covalent bonding to side chains or cofactors can lower the energy of the transition state. As such, enzymes show that evolutionary biology has produced highly effective catalysts.